IT ONLY TAKES ONE ACCIDENT TO START A FIRE. 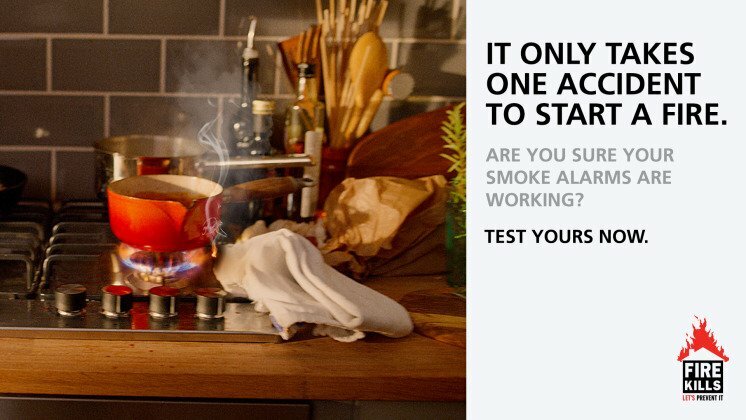 ARE YOU SURE YOUR SMOKE ALARMS ARE WORKING? TEST YOURS NOW! Last year, 248 people lost their lives due to a fire at home. Many of these could have been prevented. Everyday fire risks are present in our homes. Well-known risks include candles and cooking left unattended, covered electrical heaters, overloaded plugs, and cigarettes. Stay safe from fire in the home.